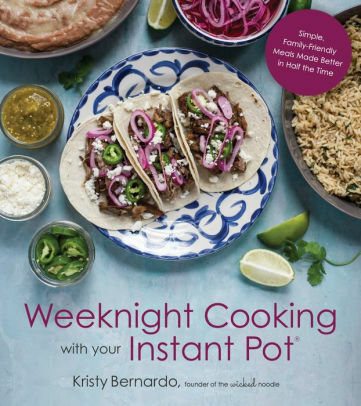 When I found out that Kristy Bernardo, who blogs at The Wicked Noodle, had written a cookbook featuring recipes for the Instant Pot, I put it right in my Amazon cart. The book, not the Instant Pot. 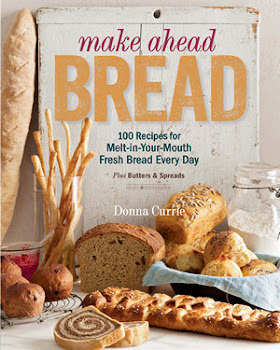 As soon as the book arrived, I pawed through it, looking for recipes I could make right away. Without going to the store. You see, the title of the book is Weeknight Cooking with your Instant Pot , so I assumed the recipes would be doable without a whole lot of shopping. And ... I was right. The first recipe I made was sesame chicken, since I happened to have some chicken thighs on hand. It was freaking delicious and really simple. Definitely something that could be made any old night after a busy day. I made the sesame chicken in my pressure cooker while I had rice in my rice cooker, and dinner was done with so little effort it was ridiculous. It would have taken more effort to pick up a phone and call for delivery. This is the ideal meal for those days when I've not planned well and it's half-past hungry and there are no leftovers waiting for me. Because that happens around here way too often. The great thing is that not only is the recipe fast and easy, but it's also a really nice meal. Not like graham crackers and peanut butter, which is what often happens when I haven't planned well. The second time I made this recipe, I cooked some frozen broccoli (a freezer staple around here) to go with it. A perfect meal, really. If you like spicy food, an easy adjustment here would be to have fun with red pepper flakes or a sliced jalapeno, or even a squirt of your favorite hot sauce. The second recipe I made from the book was Pork Chops in a Dijon Pan Sauce. The sauce was totally awesome and completely the star of the dish. Not something I would have thought about, myself. Although I'm a huge fan of mustard, I don't think about cooking with it very often. But ... I wasn't thrilled with my choice of pork chops. No matter how you cook them, pork chops can be a little finicky. Instant Pots (and other electric pressure cooker brands) cook so quickly that every minute of cooking is a big deal, so the wrong cut of pork can end up overcooked in the blink of an eye. I kind of blame the pig. Or perhaps the pork producers, who are raising leaner pigs than the ones from years ago. Of course, some folks prefer their pork chops very well done. So there's that, too. But I liked the sauce so much, I decided I had to make the recipe again, this time changing the type of chop. The second time, I used pork shoulder steaks, which work much better for braising or slow cooking, which also means they're more forgiving of overcooking. So I figured they'd be perfect for pressure cooking. And to be honest, I like pork shoulder steaks more than other types of chops, anyway. Meanwhile, I fiddled with the recipe a bit, adding onions and potatoes to the pot, so it was pretty much a whole meal. Okay, a salad or green vegetable would have been nice, too. But it was a good meat-and-potatoes recipe. Season the chops with salt and pepper. Press saute to preheat your Instant Pot (I actually used another brand of pressure cooker ). When the word HOT appears on the display, add the olive oil, then brown the chops on both sides. You'll probably need to do this in batches. It will take 3-4 minutes per side. Remove the chops and set them aside. At this point, I added the onion and potato and cooked them until the onions were soft. The potatoes are kind of a wild card here. Bigger potatoes will need to be cut, while smaller ones should be left whole. It might take some trial and error to figure out exactly what size potatoes you need to be perfectly done at the same time as the meat. Add the wine and stir to deglaze the pot. Allow the wine to reduce slightly, about two minutes. Add the chicken broth, then return the chops to the pot, along with any juices. Close and lock the lid. Set it to high pressure for 6 minutes, making sure the vent knob is set to sealing. When the time is up, allow the pot to release pressure naturally for 10 minutes, then release the remaining pressure manually. Remove the chops from the pot and tent them with foil to keep them warm. Press the saute button and allow the sauce to reduce by half, about 5-7 minutes. Stir in the Dijon. Add the butter two pieces at a time, stirring constantly until they are incorporated. This creates an emulsified sauce which is thick and luxurious. Taste the sauce and add more salt or pepper, if desired. Return the chops to the pot and toss them in the sauce to coat them and re-warm them if necessary. Sprinkle parsley over the top as a garnish, if your parsley isn't all sad and wilty like mine was. I'm planning on making a stuffed pepper soup, which is kind of brilliant. Less fuss than making actual stuffed peppers, but the flavors are all there. After that, maybe lemon risotto with peas, or perhaps one of the pasta dishes. Then again, there are also side dish recipes and desserts. Or maybe I'll go back to that sesame chicken, because it was brilliant.